that is one serious puddle! And yet he still ended up soaking! 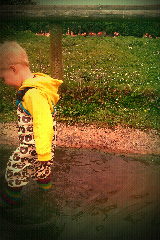 OH the joy of splashing in puddles!!!! Well if the sun is not going to shine, we still have to have fun!!! He needs waders for that puddle! Nothing better than a good old splash about...looks like he's wearing some fab scandinavian gear? Now thats a proper puddle! Ah what a great photo! Thank heavens for wellies. Allow for proper splashing. I love the muddy puddles outfit! Peppa Pig would be so proud!